The leading specialists of the department are the members of the working groupWorking Group on Information Systems and Services (WGISS) of CEOS committee and participate in the development of satellite date processing Grid-system Wide Area Grid (WAG). Project WAG (Wide Area Grid), the members of which are the representatives of CNES (France), CEODE (China) and Space Research Institute NASU-NSAU. Joint Ukraine-Chinese project to build an information infrastructure for monitoring emergencies. 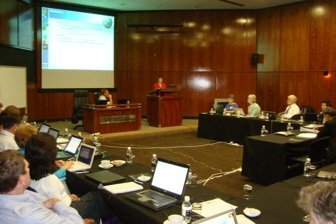 Pilot project SensorWeb technologies for monitoring floods in Namibia.